Drat, my D-tag did not register so I have no time from Sunday’s race. There I am, on the right, #1495 doing my best impersonation of the “little engine that could.” I looked up big guy 533 but there is no record of that number, he could be 535 and if he is, he had a bad day, 29:35. I looked up 1152 behind him, he ran a 28:50. I finished and two guys behind me said they ran 7:07 pace which would be a 28:28. But one never knows as the D-tags are the only way to tell them time since it can take 1-3 minutes just to get across the starting line. Anyhow the race is done. I went and saw John Henwood for a massage today. Holy Jesus did it hurt. I knew my legs were shredded but wow was it intense. I gave John a huge workout today. I think he might have even been sweating trying to get some life back into these tired old legs. I am almost as good as new. Look out! I am not whining I am observing and asking questions. 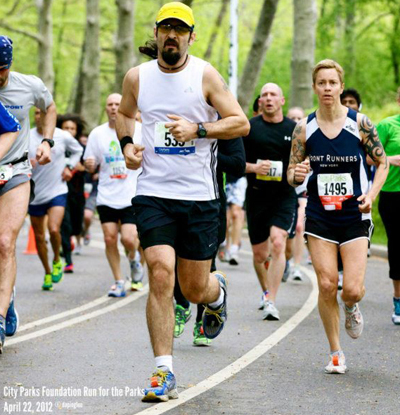 Today was the NYRR 4 mile race for the parks. It was cool, overcast and a perfect day for a PR. This is my PR, 4 mile race, a 28:27, 7:06 pace. I then ran it again at a 28:37, 7:09 pace. Today is looking a lot slower, closer to 29:00 and yes I am disappointed. No final times announced yet. Here is why, when I ran the PR, I was only running about 25 miles a week, two days were on the indoor track so I was getting some decent leg speed. The next year I was following a cookie cutter 1/2 marathon plan. Actually a very good one, from Ironbridge half marathon, I only ran 4 days a week, hills, track, long run and short run. Now I have a personal coach, two coached workouts a week and I am stronger, no doubt about that, and injury free. But my big issue is that I am running a lot and now I am slower. Will all this running translate into faster times later or am I destine to be slower and with no social life because I am always asleep from my hard workouts? I need to consult with John. Today I so wanted to go sub 7:00. My first mile was 7:04, then 6:56, then the hills 7:24 and my quads started to ache. Not like lactate ache but fatigue, nagging, like they wanted to curl up and die ache, like they were being shredded in a grater, making the last mile really hard. I got a huge side stitch unlike I have ever felt which made me want to pull off the side, then the dry heaves started while I was running and still a half mile away. Rather than puke on someone or stop I slowed down and hung on. That mile was a 7:20 which ultimately way better than I thought it would be. But boy did it hurt.In the homestretch I dropped it down to 6:30 and that actually felt good, my legs stayed under me and my heaving subsided. So my questions. Are my times slower because of my higher mileage and lack of sprint or hill work? I am running between 55 and 60 miles per week every week, no drop back weeks. My longest runs are 18 every Sunday and 10-11 on Thursday, fartlet on Tuesday, 8 x 1000 or 1200 on incline, cat hill from north to south on Saturday. The other days, Monday, Wednesday and 50:00 runs plus weight training, Friday cross training. But here’s the thing, after 5 weeks of 18 milers they are not getting any easier, and the last fartlet run on Tuesday, 8 x 3:00 at 4 mile race pace + 2:00 at marathon pace (approx) I did poorly on. Normally my favorite workout I got slower and slower. Also my legs. I love to weave the theory that my aerobic capacity is far beyond my muscle capacity and that my heart pushes to me run faster but my legs can’t sustain the action. Thanks to the advice of Julie, Races like a Girl, Threlkeld I wore my HR monitor which I have not wore in a long time. It held steady between 172 and 175 the whole race. In my other 4 mile races, 189 was the high. In one race my average was 206 with a high of 246, obviously a Garmin error. I will go back to tracking HR in my training and racing to make sure I am not over reaching. It also might be a good time to re-test my heart rate max. I think it is about 189. So that is it for racing. The Brooklyn 1/2 in four weeks is my next race, I was looking to run 7:30 pace for the whole thing but I am feeling skeptical on that. I have got to get my quads cooperating. But now I have a big beautiful day to enjoy all the while I am “clicking” refresh to see what my actual results were. Race week was easier. I ran Monday through Thursday, my longest run was on Tuesday and no speed work. Thankfully I did feel a bit rested as the week went on. The race was tough, I held on the whole way keeping the push on. My right hip, ITB was unhappy. It is too tight but held on for a new PR, tiny, but it was set in 2009 so I am thrilled. Of course I expected more, I always do. On March 4th, I ran Coogans 5k and took 1:26 off my time. Now that is huge! With a 1:26PR on a 5k I thought I could do some serious damage to the 10k, but honestly if you look over my 10k times, I did. Tomorrow I get to wake up and run 18 miles. Honestly I am looking forward to it. It will be the 4th or is it the 5th Sunday in a row that I ran 18 miles.